We took a look online and discovered 17 customer reviews of the Weider Pro 5500 Multi Gym. Overall, this multi gym scored 4.5 out of 5, with users praising the price, build quality, and weight stack. Main gripes include time to assemble (6-8 hours) and poor instructions. As a great alternative to the now discontinued Pro Power Home Gym, the Weider Pro 5500 Multi Gym System is a highly-rated, safe, and compact multi gym, perfect for those with slightly less space to set up their own home gym. Featuring a leg developer, arm press, high and low pulley stations and a butterfly station, you can hit all major muscle groups with this machine. Precision Bearing Pulley – designed for extra smooth and fluid cable movement. 85kg Weight Stack – the 85kg (187lbs) vinyl weight stack is a rugged build, for long-term resistance training and exercise. Adjustable Seat – ensure you find the most comfortable, and safe, workout position. Preacher Curl Pad – improve mind-muscle connection, and perform stricter biceps curls with this attachment. High Pulley Cable – with the multi-grip lat bar, you can target your back muscles with various grip positions while you perform lateral pull-downs. Maximum weight capacity 102kg (225lbs). Butterfly Station – padded butterfly arms. Maximum weight capacity 40kg (88lbs). Leg Developer – no more excuses for skipping leg day! Isolate your quadriceps muscles or hamstrings with the padded, 4-foam station. Arm Press – isolate arm and chest. Safety Shield – accommodates safe weight stack travel. Ankle Strap – get the most out of the pulleys. Max user weight – 135kg. Warranty is not available for non-domestic, commercial environments. *The standard warranty is 1-year parts & labour, however, the warranty will be extended free of charge to 2 years parts & labour provided the product is registered with Weider either by warranty card or via their website, along with proof of purchase, within 28 days. 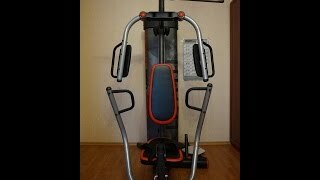 The Weider Pro 5500 Home Gym is very popular, and at the time of writing, is available from Amazon, Argos, eBay, Fitness Superstore, and Sweatband. Prices change regularly, so check back at Fitness Savvy to make sure you’re getting the best Weider Pro 5500 price. To make things even easier for you, we’ve included discount codes and vouchers which you might also be able to use on this product. Check them out to see if you can save even more before you buy! If you’re worried about putting this together, we’ve included the Weider Pro 5500 Multi Gym Manual PDF for you to take a look at. It contains important info including assembly instructions, parts lists etc.